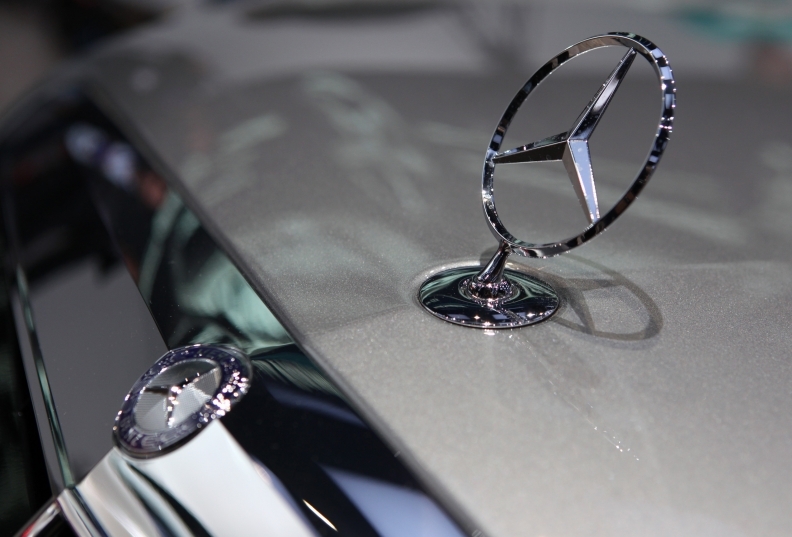 The race for the top-selling luxury marque in the United States took a turn in September as Mercedes-Benz used a 22 percent monthly gain to overtake Lexus after nine months. Sales of Mercedes-brand vehicles, including Sprinter vans, rose to 20,675, as deliveries of the E-Class sedan continued to propel the brand. Deliveries for BMW's namesake brand rose 21 percent to 18,228 from last September. Lexus sales fell 6 percent last month to 16,948, in an overall market that gained 29 percent from a weak September a year earlier. Mercedes sales are up 22 percent 165,427 so far this year, while Lexus has risen 9 percent to 162,438. BMW deliveries are up 9 percent to 157,464 in an industry that has risen 10 percent. Through August, Lexus had led Mercedes by 737 vehicles. Those results don't include sales of Mercedes' Smart cars or BMW's Mini and Rolls-Royce brands. BMW sales are being curtailed by low inventory of the X3 SUV until a new version reaches showrooms late this year, Jim O'Donnell, president of BMW's North American unit, said in a Sept. 8 interview. The automaker is also still introducing models in its popular 5-Series line. Luxury car buyers who waited for more improvement in the economy are returning, said IHS's Barker. Deliveries at General Motors Co.'s luxury division, Cadillac, gained 11 percent from last year to 12,620 as sales of the redesigned SRX SUV grew by 40 percent. Ford Motor Co. sold 7,510 of its Lincoln vehicles in September, a 26 percent increase from a year earlier. Lincoln was helped by a 76 percent increase in MKX sales. Volvo, which Ford sold in August to China's Zhejiang Geely Holding Group Co., reported a sales decline of 12 percent to 4,152. Honda Motor Co.'s Acura sales rose 48 percent to 10,720. U.S. deliveries of Volkswagen AG's Audi brand rose 13 percent to 8,151. That topped Audi's previous September sales record from 2007, the company said. Porsche SE, which is merging with Volkswagen, reported a 25 percent sales increase to 1,971 vehicles. Tata Motors Ltd.'s Jaguar posted a 10 percent gain in sales to 967 vehicles. The company's Land Rover division sold 2,489 vehicles for the month, a 12 percent increase.